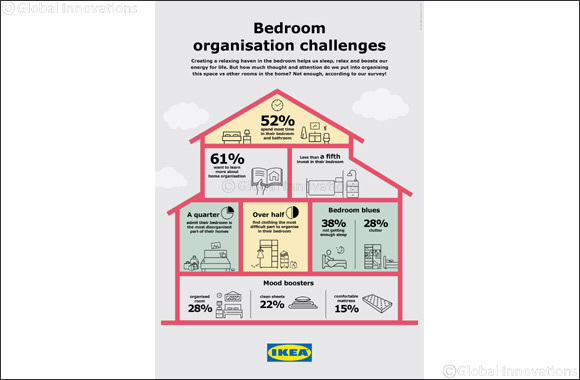 Dubai, March 21, 2019: This month IKEA conducted a survey to understand people’s habits, organisation concerns and associations to their bedrooms. The independent online survey gathered findings from 2500 respondents spread across Qatar. Insights from the survey revealed that the bedroom ranks as the most essential room in the home, where the most time is spent, yet it is the room that respondents rarely invest in and find the most difficult to organise. IKEA wants to understand how this affects day-to-day life and how it can support people’s’ functional needs for a better way to use their bedrooms. Although 52% deem the bedroom as one of the most essential rooms in the house, only 17% of respondents said they would invest in their bedroom. While 69% spent the most money and time decorating their living room, even though they use it significantly less than other rooms in the home. This shows that people prioritize spending on rooms with higher visibility, such as the living and dining rooms, where their personalities can be reflected to others. However, less attention is placed in the bedroom where 32% of respondents spent the most time in the mornings. Consumers are increasingly aware of the benefits of quality sleep and the connection between good sleep and better quality of life. Getting the rest needed and recharging batteries can help make a healthier and more productive everyday life. Making the bedroom a soothing place for relaxation helps people sleep well and gives the energy to focus on personal, family and work life. But equally important are the other ‘life’ activities in the bedroom, such as choosing an outfit, getting dressed, or having a place to disconnect. 25% of the residents who responded to the survey said their bedroom was the most unorganised room at home and 28% attributed the disorganisation to having a negative effect on their overall mood. Feeling sleepy was also identified as one of the strongest factors that put them in a bad mood (38%) followed by 27% who felt they don’t have enough time to get ready in the mornings. Moreover, majority of the respondents (60%) said clothing was the hardest part of their bedroom to organise while 56% made the effort to tidy their bedroom before leaving the house. To better understand what those solutions could be, IKEA asked respondents to note elements that improved moods in the bedroom. Room organisation topped the list at 28%, followed by clean sheets at 21% and the right bed or mattress at 15%. Lighting was also a key point as well as colour schemes, scents and art/decor. IKEA has identified key trends and insights, which have resulted in taking a back-to-basics approach to creating products and solutions that encompass a more holistic view, inclusive of not just comfort, safety and function but mental wellbeing, too. Many people experience difficulty getting a good night’s sleep because of their daily busy schedules with activities stretching into the evening, leaving little time to wind down. More work, communication, news and entertainment from the outside enter bedrooms than ever before, but the design of the space has not changed much. IKEA identifies creating a relaxing atmosphere and organisation to support healthy routines and rituals as a solution. Natural light helps people feel and perform better during the day, just as ensuring a dark room helps get better rest when it’s time to sleep. Increasing exposure to natural light during the day and reducing the use of artificial light at night are two of the simplest things that can be done to improve sleep. Managing lighting in the bedroom and increasing people’s confidence in building multi-layered window solutions that work for both day and night in an optimum way are quick improvement tools. The bedroom is where people sleep, choose an outfit, get dressed and where they seek quiet moments. Lighting must meet all these purposes. One challenge is to strike the right balance between soothing mood lighting, enough illumination to find what is needed and targeted light that’s bright enough to read by. Another is to avoid the blue light from electronic devices. People need options that will help them reduce interacting with sleep-disrupting devices in their bedroom. People often use music to make their bedroom their personal safe haven, because it helps them create the feeling of home. Lullabies aren’t just for babies; music is a great soother for everyone. IKEA wants to help people understand the power of both sound, vision and touch in creating a feeling of home. More and more people are living in smaller spaces, which means that not everyone has the luxury of having a room dedicated solely to sleep. People in co-living and single room apartments often need to sleep, eat, study and socialize in the same room. IKEA has created solutions to optimise small spaces to work for multiple activities without limiting comfort. Making the bedroom a soothing place for relaxation helps people sleep well and gives the energy to focus on personal, family and work life. Today, home, is more than ever being seen as a cocoon – a shelter that provides warmth and security in a world of uncertainty. IKEA has found that with the help of textiles, smart storage solutions and multi-purpose products, people can create an environment that ensures they start each day in the best way possible.